Football fans are notoriously tribal. Rivalries are as bitter as they are arbitrary, with long-running disputes often powerful enough to divide communities and estrange families. Rivalries are common, but increasingly, fans of different overseas clubs are putting their differences aside. It's becoming more and more common for fans of different teams to form beautiful overseas romances, forming everlasting bonds from seemingly unconnected origins. When we heard about one of these unlikely new 'fomances', we simply had to find out more. Glory spoke to Ben Hatton – supporter and shareholder at Bath City FC – about his team's surprising link with Italian Serie D outfit Calcio Lecco. Tell us a bit about yourself. 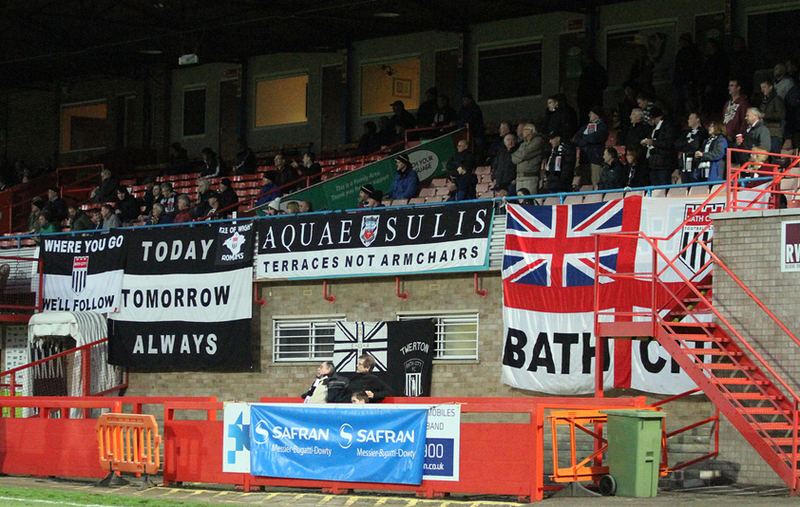 How did you became a Bath City supporter, and what's it like to follow the National League South? "I started going back in 1998, when I was four. My Dad was a keen fan and wanted a game against Kings Lynn to be my first. I honestly don't remember much other than winning 2-0, but I obviously enjoyed it enough to continue going! Being a fan of Bath City has its ups and its downs. We aren't the best in the league, but we have our moments of brilliance – coupled with times of utter stupidity and heartbreak. We've just become community owned, so now it's about becoming sustainable and ingraining ourselves in the community, with the aim of being a football league side in 10-20 years or so." Do you have any decent players ? "I'm not going to lie, we don't have any standout players at the moment, but the season is young and time is (hopefully) going to prove me wrong. We have a couple of ex-Bristol City academy players in Billy Murphy and Jack Batten, who could definitely play at a higher level." What can visiting fans expect from Twerton Park? "Twerton Park is a work of art. It's rustic and falling apart in places, but a team of 30 or so 'Romans', including myself, helped fix the old girl up a bit this summer. She's a thing of beauty when the sun hits her, and you get a fantastic backdrop of Bath when stood on our curved terraces." Have any ex-players gone on to play in the Football League? "Some of last season's loanees – Max O'Leary from Bristol City and Axel Andresson from Reading – are destined for greater things. Andresson, an Icelandic U21 international, will be captain of their national team one day, he'ss that good! We also had Liam Kelly, a dynamic midfielder on loan from Reading at the end of the 2015/16 season, and he went straight into Reading's squad last year and made 34 appearances for them! Recent Norwich City signing, Marley Watkins, also spent two years at Twerton Park. Aside from that, a couple of greats have played for us including Stan Mortensen and Tony Book." So tell us about Bath City's partnership with Calcio Lecco. How did you end up partnering with an Italian Serie D team? "At the start of 2017, some Calcio Lecco fans messaged the club and said that five or six of their supporters would be coming over to watch a Bath City game. This was because the two clubs met in the final of the Anglo Italian Cup in 1977, where they emerged triumphant. It was the 40-year anniversary of this achievement, and they wanted to celebrate their triumph. They came over for a weekend in February to watch us take on our local rivals Weston Super Mare, only to find that the game had been called off at the last minute just before kick-off. This somehow didn't dampen their spirits, and they challenged some of our fans to a game of beach football – which they won." "They then invited us over for a 'summer celebration'. 22 Bath supporters ventured to Italy, and played in a match at Stadio Rigamonti-Ceppi. The game ended in a 2-2 draw. It was a crazy match, and their 250/300 supporters lit up the stadium at the end with flares – and this was just for a supporters' match!" We've seen #terracesnotarmchairs hashtag used on social and some of your stadium banners. Can you tell us what it represents? "Terraces Not Armchairs is my favourite flag. Even opposing fans seem to gravitate towards it and comment on how much they love it! It basically means that you should go and watch football in person rather than sitting at home, giving money to the large media conglomerates. I don't care if it's Manchester United, Gillingham, or Warminster Town – go and watch them instead of being an armchair supporter. Grassroots football is dying, and it needs fans of real football to support them if it is to exist in the future."